Edirne is a city in the northwestern Turkish province of Edirne in the region of East Thrace, close to Turkey's borders with Greece and Bulgaria. Edirne served as the third capital city of the Ottoman Empire from 1363 to 1453, before Constantinople (present-day Istanbul) became the empire's fourth and final capital. The city's estimated population in 2014 was 165,979. The city was founded as Hadrianopolis (Ἁδριανούπολις in Greek), named for the Roman Emperor Hadrian. This name is still used in the Modern Greek (Αδριανούπολη). 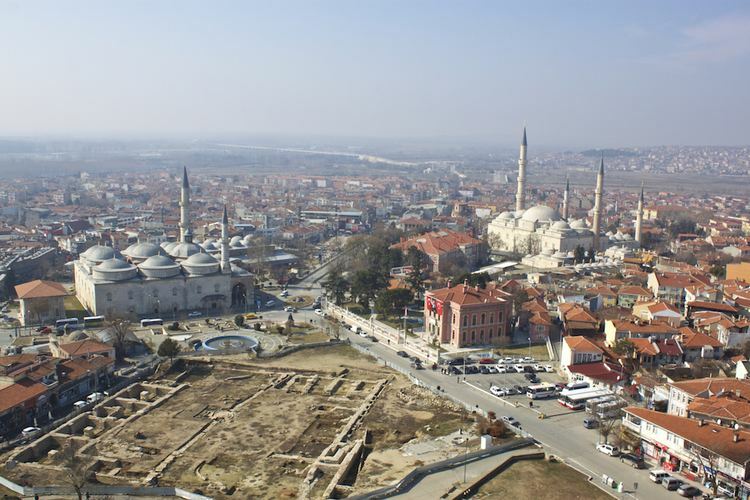 The Turkish name Edirne derives from the Greek name. The name Adrianople was used in English, until the Turkish adoption of Latin alphabet in 1928 made Edirne the internationally recognized name. Bulgarian: Одрин (Odrin, ['odrin]), Albanian: Edrenë, Slovene: Одрин (Odrin) and Serbian: Једрене / Jedrene are adapted forms of the name Hadrianopolis or of its Turkish version; see also its other names. According to Greek mythology, Orestes, son of king Agamemnon, built this city as Orestias, at the confluence of the Tonsus (Toundja) and the Ardiscus (Arda) with the Hebrus (Maritza). The city was (re)founded eponymously by the Roman Emperor Hadrian on the site of a previous Thracian settlement known as Uskadama, Uskudama, Uskodama or Uscudama. It was the capital of the Bessi, or of the Odrysians. 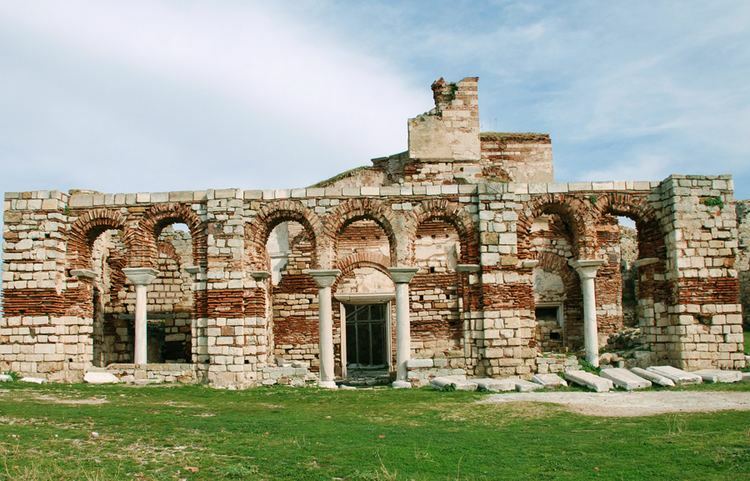 Hadrian developed it, adorned it with monuments, changed its name to Hadrianopolis after himself (which would be corrupted into Adrianopolis, Anglicised as Adrianople), and made it the capital of the Roman province of Thrace. Licinius was defeated there by Constantine I in 323, and Emperor Valens was killed by the Goths in 378 during the Battle of Adrianople (378). In 813, the city was seized by Khan Krum of Bulgaria who moved its inhabitants to the Bulgarian lands towards the north of the Danube. During the existence of the Latin Empire of Constantinople, the Crusaders were decisively defeated by the Bulgarian Emperor Kaloyan in the Battle of Adrianople (1205). Later Theodore Komnenos, Despot of Epirus, took possession of it in 1227, but three years later was defeated at Klokotnitsa by Asen, Emperor of the Bulgarians. In 1369, the city was conquered by the Ottoman sultan Murad I. He renamed it "Edirne". The city remained the Ottoman capital for 90 years until 1453, when Mehmed II moved the capital to Constantinople (present-day Istanbul). 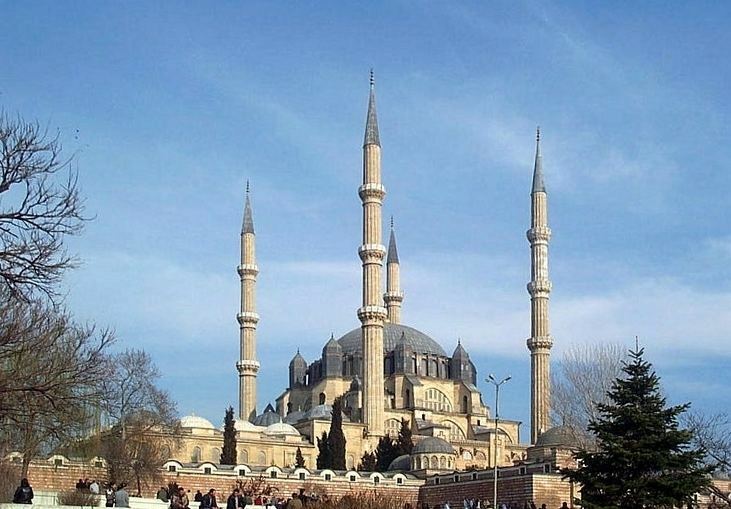 Edirne is famed for its many mosques, domes, minarets, and palaces from the Ottoman period. 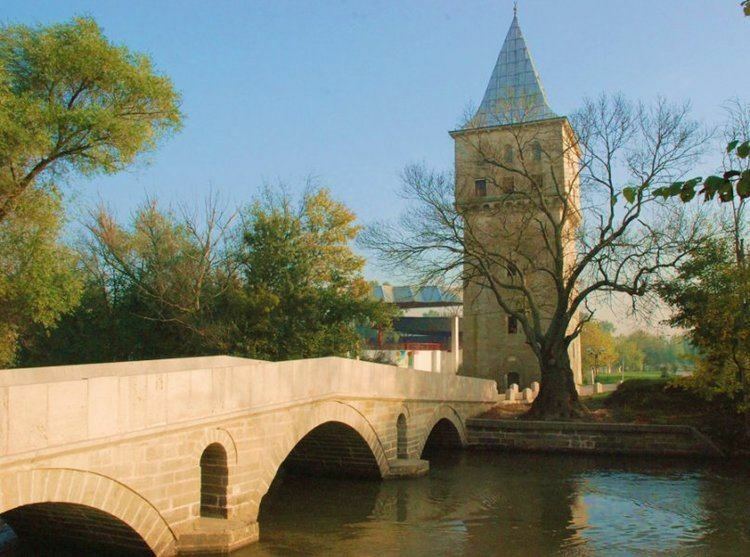 Under Ottoman rule, Edirne was the principal city of the administrative unit, the eponymous Eyalet of Edirne, and after land reforms in 1867, the Vilayet of Edirne. Sultan Mehmed II, the conqueror of Constantinople, was born in Edirne. It was here that he fell under the influence of some Hurufis dismissed by Taş Köprü Zade in the Şakaiki Numaniye as "Certain accursed ones of no significance", who were burnt as heretics by a certain Mahmud Pasha. Edirne was briefly occupied by imperial Russian troops in 1829 during the Greek War of Independence and in 1878 during the Russo-Turkish War of 1877–1878. The city suffered a fire in 1905. In 1905 it had about 80,000 inhabitants, of whom 30,000 were Turks; 22,000 Greeks; 10,000 Bulgarians; 4,000 Armenians; 12,000 Jews; and 2,000 more citizens of non-classifiable ethnic/religious backgrounds. Adrianople was made the seat of a Greek metropolitan and of a Gregorian Armenian bishop. Adrianople is also the centre of a Bulgarian diocese, but not recognized and deprived of a bishop. The city also had some Protestants. The Latin Catholics, foreigners for the most part, and not numerous, were dependent on the vicariate-apostolic of Constantinople. At Adrianople itself were the parish of St. Anthony of Padua (Minors Conventual) and a school for girls conducted by the Sisters of Charity of Agram. In the suburb of Karaağaç were a church (Minor Conventuals), a school for boys (Assumptionists) and a school for girls (Oblates of the Assumption). Each of its mission stations, at Tekirdağ and Alexandroupoli, had a school (Minor Conventuals), and there was one at Gallipoli (the Assumptionists). Situated 7 km (4.3 mi) near to the Greek and 20 km (12 mi) to the Bulgarian border, Edirne is famed for its many mosques, domes and minarets. The Selimiye Mosque, built in 1575 and designed by Turkey's greatest master architect, Mimar Sinan (c. 1489/1490–1588), is one of the most important monuments in the city. It has the highest minarets in Turkey, at 70.90 m (232.6 ft) and a cupola 3 or 4 ft (0.91 or 1.22 m) higher than that of Hagia Sophia, the Byzantine Orthodox Cathedral (now museum) in Istanbul. Carrying the name of the then reigning Ottoman Sultan Selim II (r. 1566–1574), this mosque futures Turkish marble handicrafts, and it is covered with valuable tiles and fine paintings. Another notable mosques are Eski Cami (Old Mosque), and Burmalı Cami (Serpent Mosque), aka Üç Şerefeli Mosque. The Balkan Wars Memorial Cemetery is located close to the Edirne Palace, with an unknown soldier monument futuring an Ottoman soldier in front of its entrance. Edirne is home to the traditional oil-wrestling tournament called Kırkpınar, which is held every year in June. Another international festival in Edirne is Kakava, a celebration of Roma people held on 5 May each year. A cultural partnership with Lörrach in Germany has been started in 2006. The goal is to exchange pupils and students to improve their cultural skills and understanding. Edirne is well known for the local dish "ciğer tava" (breaded and deep-fried liver) served often with cacık, diluted yogurt with chopped cucumber. Handmade broom with mirror is one of the cultural images of the city. In old times, every bride brought a broom with mirror to her new home so it was an important part of the weddings. It is possible to see many small handmade brooms with mirror in souvenir shops. Edirne's economy largely depends on agriculture. 73% of the working population work in agriculture, fishing, forests, hunting. There are lots of things that are cultivated here. Its lowlands are productive. The field crop cultivation has developed so much here. Corn, sugarbeet and sunflower are the first. Melon, watermelon and viniculture are advanced. For the last decade, the agricultural products have doubled. Corn, rice, sunflower, sugarbeet, tomato, eggplant, melon, watermelon, grape are cultivated so much. The through highway with an important role in global transport that connects Europe to Middle East and Anatolian to Istanbul passes through Edirne. Also, the existence of many historical and natural touristic places and events lead the fact that tourism has become a leading component of the economic growth of the city in recent years. Industry has also been developing. Agriculture-based industries (agro-industries) are especially important for the city's economy.